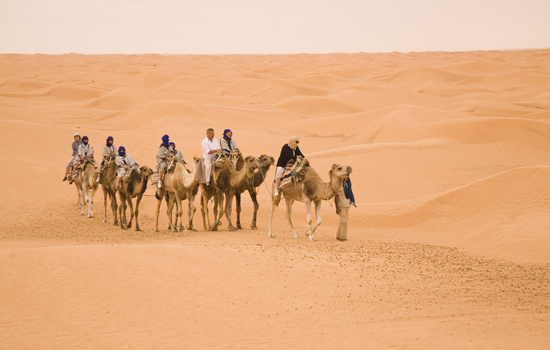 A vague image of a camel caravan plodding over golden desert dunes was all that my mind could conjure up whenever North Africa was mentioned before this, my first trip to Tunisia. Holiday makers sunning themselves on the private beaches of resort-hotels and luxury hotels set within hectares of palm groves were added to that mental picture only during my trip to Djerba. 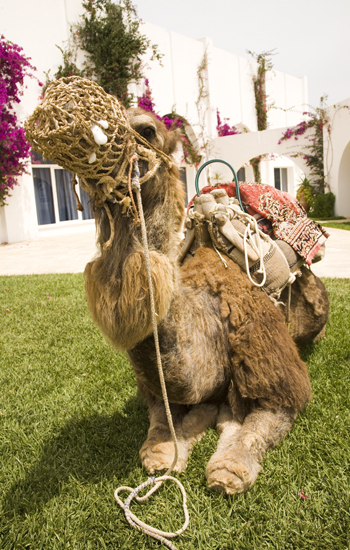 The Mediterranean island of 208 square miles, located just three miles off Tunisia’s southern coastline, Djerba (sometimes also written as Jerba) is now easily accessible from London, as Tunisair has started flights between Gatwick and Djerba on Mondays and Thursdays. The plane pauses briefly to set down and pick up passengers in Monastir, close to Sousse, then continues on its three hour journey. Sun seekers from continental Europe have already discovered Djerba and many of the locals have that envious talent of being able to switch between French, Spanish, Italian and German before tuning into English, the communications frequency which works best for me. A smattering of French comes in handy here, especially if you want to chat with people and find out more about the local culture, but a number staff in the four and five star hotels set within the island’s sizable Zone Touristique – the Tourist Zone which also hosts the island’s golf course, casino and a selection restaurants – have a reasonable command of English. Sunbeds on the beach, set under straw sunshades, and cocktails brought by uniformed waiters to loungers by the poolside appeal to the majority of foreign visitors seeking their R&R on Djerba. And quad-bikes, kite surfing, archery, tennis and beach volleyball are among the activities offered to the more energetic guests. But my fair skin’s intolerance of the sun’s ultra-violet rays and a desire to taste a glass of traditional mint tea in a market place – a souk as they are known here – had me scurrying for the shade of Midoun, one of the island’s towns. Sensibly, the local women dress in long cloaks and wear broad-brimmed straw hats to protect themselves from the sunshine. A couple of them bustled past me in the souk as I looked at an array of colourful pottery from the village of Guellala on the island’s south. They looked suspiciously at my camera and I thought that it would be best not to photograph them, in deference to local sensibilities. Even many of the men around the market made it clear that they did not want to appear in pictures; a wish I reluctantly accepted. Browsing the shops of the souk meant dealing with enthusiastic sales pitches and invitations into shops to look at shoes “made from real camel leather, sir” and promises that “I give you good price.” In many of the shops, haggling over the price is all part of the purchasing process. 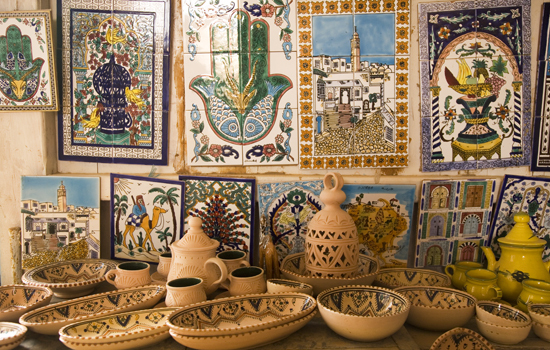 But Midoun and Houmt Souk, Djerba’s largest town and the island’s administrative capital, both have a number of “fixed price shops” aimed at tourists who would rather avoid prolonged price negotiations for items such as ornate bird cages, hand-crafted textiles or the chicha water-pipers that men can be seen smoking in local cafes . After a stroll around the souk I headed back to my hotel, the Yadis Djerba, to try out a spa session. The three-and-a-half hours of pampering was over in what seemed like no time, such was level of relaxation that I experienced in the hot steam of the hammam and while floating with buoyancy aids in the salt-water thalasso pool. The hands of the masseuse worked away the knots in my back that hadn’t already been expelled by the underwater jets within the pool and I came away feeling that I had just experienced a definition of the term “divine”. 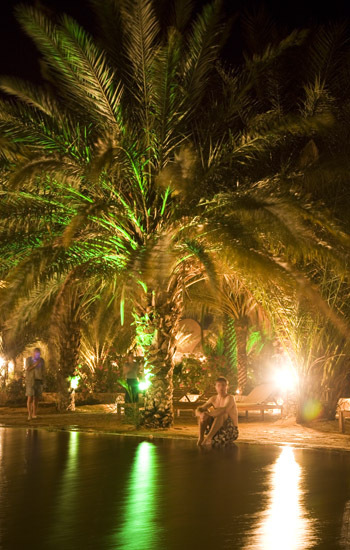 In retrospect, perhaps I should have saved my spa session until after I’d returned from a trip into the Sahara, where I stayed overnight, 120 miles from Djerba, in luxury tents at Ksar Ghilene Pansea, an oasis with thermal springs. There was nothing pioneer-like about this night under linen. The tents have real beds, plumbed toilets and showers with hot and cold water. “This isn’t camping, it’s glamping,” joked one of the women on the trip. The resort even had a palm-fringed swimming pool, possibly the last thing I’d have expected in the desert and something I couldn’t take advantage of because, accordingly, I hadn’t packed my swimming trunks. Strolling out into the dunes after midnight and looking back on the oasis’s palms under a bright full moon did, however, make up for not having a swim. The three hour drive, in a four wheel vehicle, impressed upon me the scale of olive production on the island and in groves on the mainland. For mile after mile, rows of dusty olive trees dominated the arid landscape. 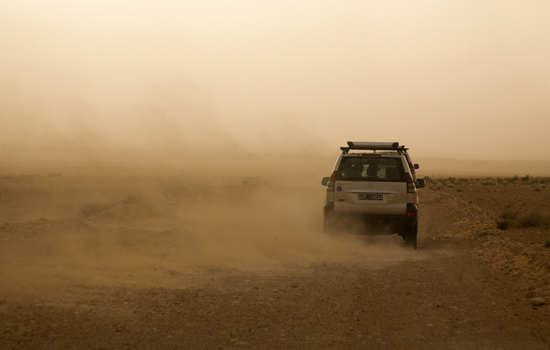 They then gave way to scrub and rocks as we entered the world’s biggest desert. Sandy dunes – known as ergs here in Tunisia – form, I was surprised to learn, just a relatively small part of the otherwise rock-strewn Sahara but Hollywood location scouts found them here ahead of filming The English Patient. And perhaps the region will experience an influx of English fans now that direct flights from London have started to the area whose architecture inspired Star Wars Director George Lucas while creating the village in which Luke Skywalker was raised. A destination that may once have seemed as reachable as “a galaxy far, far away” is, after all, now just three hours distant. 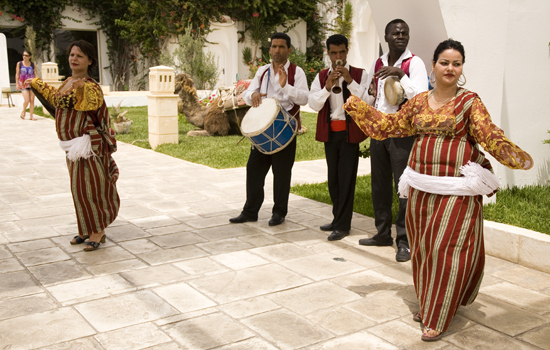 Tunisair flies between London Gatwick and Djerba (via Monastir) twice a week, on Mondays and Thursdays. Return flights start from £220. Yadis Djerba Golf Thalasso and Spa Hotel (BP 84, 4116 Midoun Djerba, tel +216 7574 7235) set by a beach on 14 hectares of land this five star hotel has 330 rooms, including 11 Ambassador Suites, one Presidential Suite plus one Royal Suite. Activities including golf, tennis, horse riding and water sports can be arranged while pool access, archery, water polo, volleyball and football are free for guests. 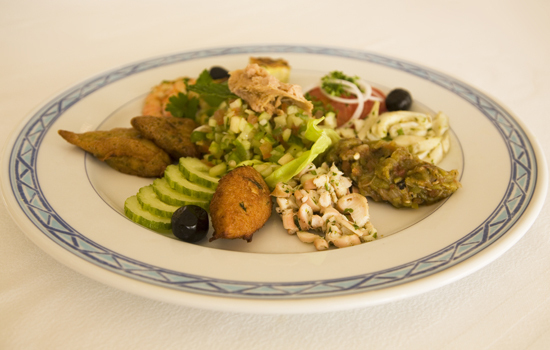 Radisson SAS Resort and Thalasso (BP 712, 4128 Djerba, tel: +216 7575 7600). The hotel has 276 rooms, 14 Junior Suites and six Ambassador Suites (each of which has an area of 120 m²) plus the renowned 3000 m² Athénée thalasso which boasts 60 treatment cabins. 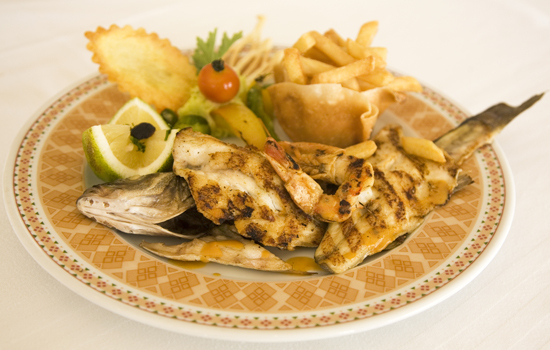 Hasdrubal Prestige Hotel (BP 82, 4116 Midoun Djerba, tel: +216 7573 0657). 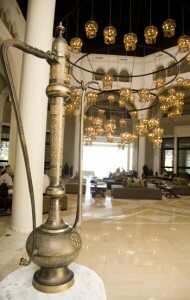 This elegant Thalassa and Spa hotel combines elements of Tunisian architecture with aspects of contemporary design. 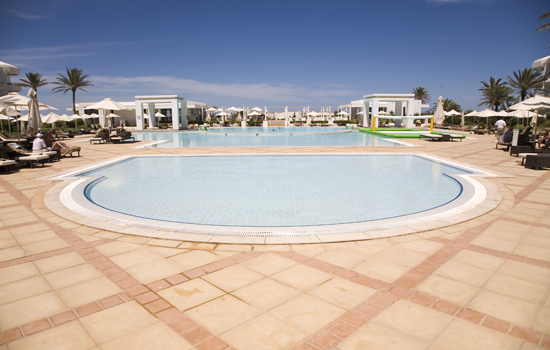 Seabel Rym Beach (BP 155, 4116 Midoun Djerba, tel: +216 7196 1501). Pleasantly located on an 11 hectare resort, which includes access to a private beach, this hotel has 275 standard and 79 superior rooms. The spa has an attractive and intimate feel. Park Inn – Ulysse Resort and Thalasso (BP 329, 4128 Djerba, tel: +216 7575 8777) has 242 rooms, three restaurants, five bars, the 3500 m² Ulysse Thalasso plus an outdoor pool, two saunas and a hammam. 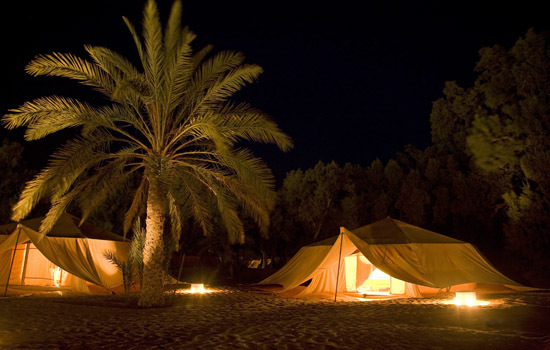 Overnight accommodation in luxury tents out at an oasis in the Sahara desert, at Ksar Ghilene Pansea, costs from 95 dinars (£45) per person for bed and breakfast. For more information call +216 7562 1870. The camp’s website is currently under construction. A round of golf at Djerba Golf Club (BP 360, 4116 Midoun Djerba, Tel: +216 75 745 055). The club has three nine hole courses – including bunkers, dunes and water obstacles – designed by Martin Hawtree. 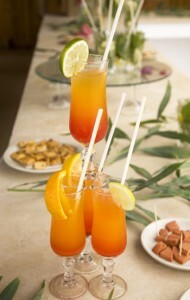 The three courses are designed to be played in combinations. Les Palmiers (3056m) is the most challenging of the courses, the others being La Mer (3130 m) and Les Acacias (2722m). The course is within easy reach of the Moevenpick Ulysse Palace, Club Med, Sofitel, Yadis Djerba Golf and Thalasso Hotel, Aldiana Altantide and Royal Garden Palace. It is possible to hire equipment, including half-sets of clubs, trolleys and buggies. Reserving a tee-off time is necessary during the high season, from October to May. The course is open from 7.00 am to sunset. It is also possible to spend a night on the tables or on the slot machines at the Casino Partouche (BP94 Sidi Mahrez, 4179 Djerba, tel: +216 7575 7537) within Djerba’s Tourist Zone. 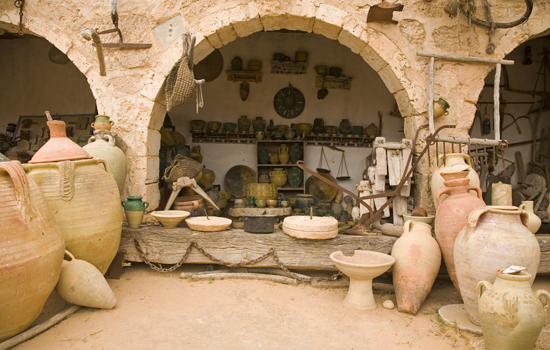 To find out more about the island and its culture head to Djerba Explore an attraction which includes the Lallia Hadria Museum (which hosts a collection of Islamic art dating as far back to the seventh century), Djerba Heritage (including looms, an olive oil press, plus traditional architecture) and a crocodile farm. 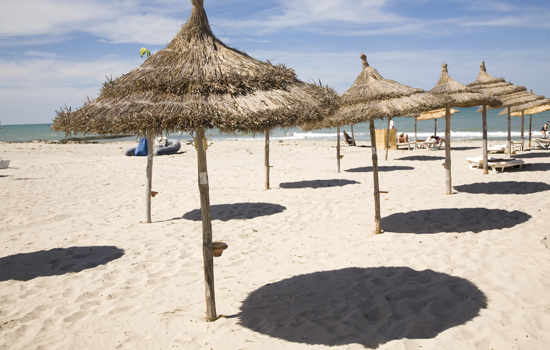 If your skin tends to burn then pack a broad-brimmed hat, sunglasses and a high factor sun lotion to protect yourself against too much Tunisian sunshine. 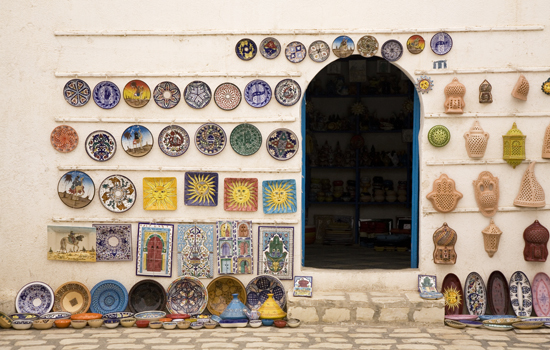 Stop off at one of Djerba’s souks to buy traditional souvenirs such as silver bracelets, camel leather shoes, a chicha pipe, spices or clothing made from hand-woven fabrics. 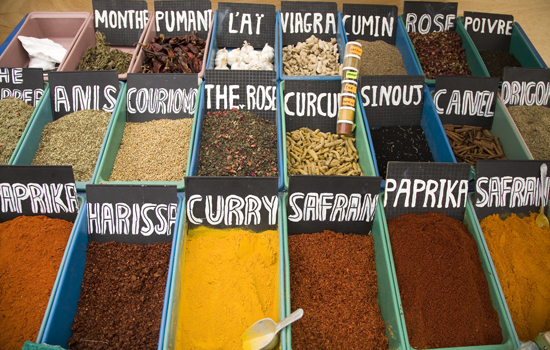 Haggling is all part of the process unless you go to a fixed price store. 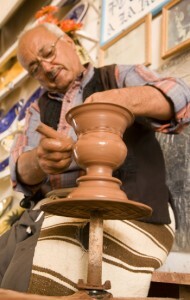 Great travel website and a wonderful article. It reads well and the photographs are excellent. This really captures the spirit of the place and the hotel details have been useful in me planning my next trip. You took me there!!! Great article. Well written, great photos, informative; I want to go there. Travel agents here I come. Pleased to see another great article on this site. When will the photos also appear on http://www.whyeyephotography.com? I am looking forward to more articles soon. A wonderful piece of travel journalism. I love the photos and the article is enjoyable to read and very well written. What a great site. I’ll be back.